A new, almost entirely untested genetic modification technology, called RNA interference, or double strand RNA (dsRNA), is responsible for this new food miracle. Scientists warn that this genetic manipulation poses health risks, as the manipulated RNA gets into our digestive systems and bloodstreams. The biotech industry claims otherwise. When the Biotech Industry Organization gathers next week in Chicago for the 2013 BIO International Convention,BIOTECanada will present its “Gold Leaf Award for Early Stage Agriculture” to Okanagan Specialty Fruits, Inc. (OSF), purveyor of the Arctic® Apple, slated for approval in the U.S. this year. We hate to upset the biotech apple cart, but a pesticide-intensive GMO apple, produced through a risky manipulation of RNA, doesn’t deserve a place on our grocery shelves, much less in the agriculture hall of fame. Gold is waiting to see what happens. Japan and the US are pumping up the monetary base – fast. But collectively, their balance sheets actually contracted by $415 billion in the first quarter – led by a $370 billion decline in the ECB’s balance sheet. Result: slightly less paper money in the developed economies… and a slightly lower gold price. Seems logical. Seems sensible. 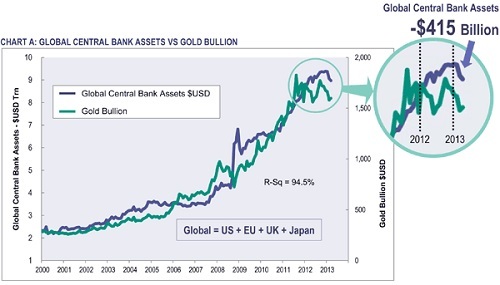 You see, since the start of the secular bull market in gold, there has been a nearly perfect correlation between the gold price and the rate of balance sheet expansion (aka money printing) at the Fed, the ECB, the Bank of England and the Bank of Japan. You can see clearly it in this chart courtesy of our friends at the Sprott Group. According to Sprott, for every extra $1 trillion in collective balance sheet expansion by these central banks, gold has risen $210 per ounce. Gold is the world’s alternative money. It and bitcoins. New supply of paper money is expanding rapidly. New supplies of gold and bitcoins are much more stable. But many mainstream pundits are sure the end of the secular bull market in gold is at hand. Who knows? Maybe they’re right. But it seems more likely that when the Japanese get their presses running hot, the price of gold will resume its upward climb. One of the more memorable evenings I once spent was with my sainted friend and author Marilyn Ferguson (happy b-day Ferg!) at the New York condominium of former psychic spy and government remote viewer Ingo Swann. Ingo Swann was a psychic, artist, and author, best known for his work as a co-creator along with Russell Targ and Harold Puthoff of the discipline of Remote Viewing, specifically the Stargate Project, writing several books on remote viewing and related topics. Ingo was born September 14th 1933 in Colorado at the small town of Telluride. He attended Westminster College in Utah where he attained his double bachelor’s art and biology degrees. After school, Ingo joined the Army where served for 15 years, 3 of which he served in Korea and the other 12 under the U.N Secretariat. During the 12 years under UN, Ingo was also trying to build his solo career in art. Ingo’s active participation in parapsychology research began at age 36, in the year 1969. Until he was 56, Ingo only worked in highly controlled lab environments. He worked alongside other researchers in the PSI investigations field. Ingo was highly involved in lectures pertaining psychic potentials and its faculties but had never demonstrated the abilities he had publicly. Due to his notable participation in numerous experiments and trials, he was included in various writings by renowned authors among them being Martin Elbon who referred to him in his book as “parapsychology’s most tensed guinea pig”. Some psychic news and media outlets termed Ingo as the “scientific psychic” due to his enormous involvement in the science. Due to some evident personal potential in psychic abilities while still in his childhood, Ingo grew more and more interested in parapsychological literature as well as occult through participation in mind and psychic development type programs. Our dear departed friend, Marilyn Ferguson’s birthday was today. For those who haven’t heard of her … scratch that, everyone has heard of Marilyn, right? A founding member of the Association of Humanistic Psychology, Ferguson published and edited the well-regarded science newsletter Brain/Mind Bulletin from 1975 to 1996. She eventually earned numerous honorary degrees, served on the board of directors of the Institute of Noetic Sciences, and befriended such diverse figures of influence as inventor and theorist Buckminster Fuller, spiritual author Ram Dass, Nobel Prize-winning chemist Ilya Prigogine and billionaire Ted Turner. Ferguson’s work also influenced Vice President Al Gore, who participated in her informal network while a senator and later met with her in the White House. As a professional freelance writer of popular magazine articles in the 60s, including Cosmopolitan and Time, Ferg developed an enduring interest in what came to be known as the “human potential” movement, and particularly the latest research on the potential of the human brain, with its implications for learning, creativity and wellness. 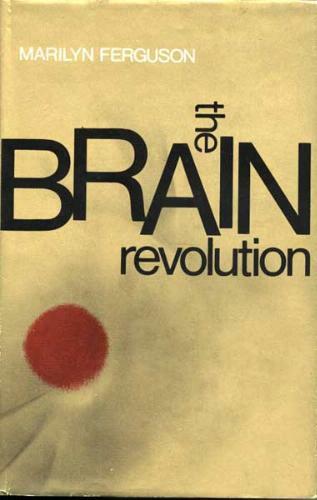 This inspired her to write The Brain Revolution: The Frontiers of Mind Research (Taplinger, 1973), a successful and broadly hailed popular summary of these discoveries.